Since the review: 2005 Camry sedans have a restyled front clip and standard ABS; four-cylinders get the "intelligent" five-speed automatic. Interior trim and features have been upgraded. The Toyota Camry is America's best-selling car, and for good reason: its size is just right for most people, striking a balance between interior space and parking ease; its suspension provides a soft, comfortable ride, and the drivetrain responds well to ordinary driving; the reliability is generally acknowledged to be superior; and the price spans the gamut from affordable to near-luxury. The Camry hit the sweet spot of American tastes, providing a combination of American soft ride and Japanese size. Our loaded XLE sedan came with a standard V6, auto climate control with filtration, JBL sound, woodgrain-style trim, a five-speed automatic, and other features, at the top of the Camry range at $25,405. Adding in the stability control and side airbags, along with four wheel antilock brakes, greatly increased safey and resulted in a $1,300 sticker boost - well worth it. The XLE Premium package, with leather and power front seats, added $1,220 and is more debateable, though the leather impressed passengers; adjustable pedals and floor mats together raised the ante $300, for a total, with destination, of $28,714. That's getting close to the Avalon, Cadillac CTS, and Lexus IS. The ride was well insulated, with rough and nasty roads translating into slight jiggles now and then, and noise that sounds as though it could be coming from another car; no subsonics disturbed the cabin even on the nastiest roads. We appreciated the ability of the Camry to keep the outside world at bay on some streets, while simultaneously allowing spirited driving around turns which we strongly suspect would not have been possible without the active suspension. Whipping through turns is possible, but it doesn't necessarily feel right, partly due to the high level of steering assist and to some body roll. Fortunately, most drivers prefer to drive normally, which, incidentally, is why it's called driving normally. And for that, the Camry is quite good. The corner-hugging crowd will find a large number of cars awaiting them, such as the BMW 326, Dodge Neon and SRT-4, Mitsubishi Galant, Mitsubishi Eclipse, and Subaru WRX. The Camry SE, with its tighter suspension, may also be a good compromise. It, too, is available with the V6 - as well as a more potent 225 horsepower 3.3 liter V6 that no doubt has more low-end punch, at the cost of only one mile per gallon. Even base model Camrys have a good ride and sound insulation, along with good enough cornering to satisfy most people. That said, we found that the tires on our test car tended to chirp or protest a bit on sudden acceleration and hard turns - though not as much as on past models. The Camry is a very comfortable car, but not a "driver's car" - not designed for high performance handling. To most buyers, that's exactly as it should be, which is one reason why the Camry is a best seller - and why Accord buyers, when convinced to drive one, often switch. The 3 liter V6 engine provides 210 horsepower, but most of it comes at high engine speeds, so that there may be a delay before you actually get moving. Indeed, the transmission tended to have a substantial delay before downshifting when faced with sudden throttle changes, resulting in a condition not unlike turbo lag. This could be disconcerting when moving from a stop sign onto a busy, fast street or highway. Because the transmission changes the way it shifts to meet your driving style, it slowly became more responsive as we drove to match our preferences; the prior driver had apparently been more gentle on it (we've always wondered why they don't allow dual driver preferences for the transmission, as well as for the seat positions). However, we never got around a substantial hesitation on heavy acceleration, most likely because the engine's power is largely made at revolutions. On the highway, the transmission became fairly responsive and the engine's power was appreciated for quick passing. The drivetrain certainly responded well to gentle driving, with the engine providing better gas mileage and the transmission being very smooth; but on the highway the transmission sometimes hunted for the right gear. Overall, the transmission did get better, but was still not as responsive or decisive as we'd like. The transmission is "sealed" - there is a dipstick for fluid, but you are not supposed to check the fluid level (there's no way to do it) and transmission fluid changes are very infrequent. This is part of a continuing trend; fortunately, Toyota did not also go for the trend of having only a single mechanical lock, so you can use the key on either the driver or passenger side. The V6 is very good on sprints, where the five-speed automatic helps by keeping the engine up in its power band, without the disconcerting sag experienced in cars with large gaps between gears. Zero to sixty times are quite competitive at around eight and a half seconds with the V6; floor the gas and you can count to three, then the engine and transmission get their act together and you rush off with a rush of power and no apparent torque steer. The four cylinder does well too, taking around one second more, but with a two or three mile per gallon savings (automatic to automatic) - one more mpg if you choose the smooth, easy to use manual transmission. Another engine option, a 3.3 liter 225 horsepower V6, is also now available on the SE. V6 gas mileage of 21 city, 29 highway is about average for the class, though we found ourselves wishing for another go with the Prius at the gas station; again, the four cylinder manual does substantially better and is, in our opinion, more fun. The engine is unfailingly quiet and smooth, never shaking despite its low idle speed. At idle, it's hard to tell that the engine is on without looking at the tachometer. 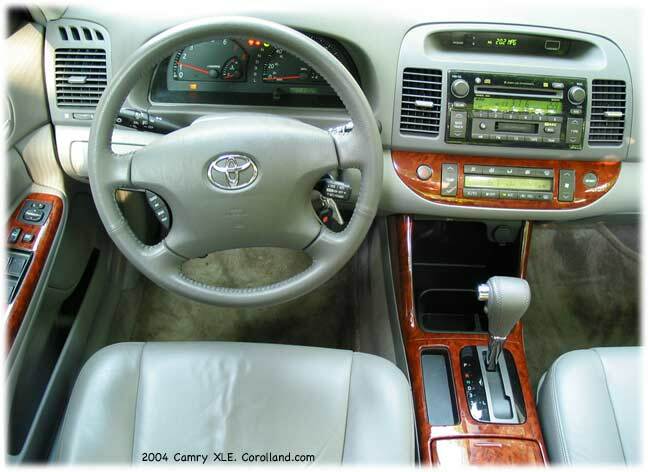 The interior of the Camry is very nicely done, and looks more refined than the previous generation. The interior space was generous, with good headroom and shoulder room, and enough space in back to allow adults to sit in comfort, though not as much room as competitive American vehicles (or the Avalon, which is essentially a stretched Camry). The trunk was enormous, and included a cargo net and a small area for small things. The dashboard has two main pods, the instrument panel and the center stack; the stack is no longer a simple linear stack of stuff, but is now a rounded piece that follows the contours of the dash. At the top is the readout for the trip computer (or a clock), which in our vehicle showed the time and temperature, or gas mileage, or distance to empty, or a number of other information tidbits; it was controlled from the steering wheel, with two large buttons. This system is more convenient than many similar systems, including the Chrysler one that started the trend. A compass was built into the autodimming mirror. Noticeably absent was dual-driver preferences for seat positions and such. Below the trip computer is a stereo with a curved face; the stock JBL system provided excellent sound, but those who demand more may find it hard to match the fit perfectly. The JBL stereo has clear, easy-to-use large buttons and a larger than usual display, making the system easy to use. It included both a cassette player and a six-CD changer. The climate control, integrated into the dash below, also had large, easy to use buttons. Oddly, it seemed to want to have air recirculation on at all times; we had to manually deselect it numerous times to get fresh air. The fan was quiet even at its highest speed, and air conditioning seemed effective. At the bottom of the center stack was a large storage area with a rubberized bottom to avoid rattles, and walls to allow different objects to share the space without bumping into each other. There were also map pockets on all four doors and on the back of the front seats, Toyota's usual dashboard tray on the left, a sunglass holder overhead, a pair of cupholders in the center console (which can easily be converted to a larger space by flipping a piece up into the lid), and a two-part covered center storage unit that was both large and easy to use. The speedometer and tachometer were large and easy to read, with a small temperature gauge and fuel gauge inside the sweep. The speedometer went up to 140 mph, a bit on the high side, so that the speeds one normally goes were a bit compressed, though still clearly readable. The usual, convenient Toyota cruise control stalk was accompanied by two stalks for most other functions. Lighting options included daytime running lights as well as the usual headlights on and off, and running lights. Being able to shut off the DRL system is a nice feature. On the underside of the instrument panel are the rarely-used switches: pedal back-and-forth (optional) and traction control defeat. The remote gas tank and trunk openers were side by side on the floor, easy to reach with the door open or closed; an arrow on the fuel gauge pointed to the side of the car with the filler cap. Overall, controls felt good and were easy to use, including the center-mounted shifter - which allowed the choice of any gear as well as Drive. Fourth was selected by a button, and first by moving all the way back and then to the side. Most manufacturers don't allow for this many options with five-speed automatics. We did find the express power window feature to be overzealous - though we appreciated having it on the moonroof for quick opening and closing. Every 4,500 miles, a "maintenance required" indicator light goes on to remind the driver of the 5,000 mile oil change. This may help some drivers to remember, and help others to avoid changing oil too frequently. It is easy to turn off though somewhat unnerving to see for the first time, without warning that it's just a reminder light! Presumably dealers tell customers about it in the sales process. Visibiltiy was generally very good, with built in side window demisters, though the rear pillar presented a blind spot. Headlights were strong, and the white backlighting was clear and not distracting. Interior lighting is very good, with push-activated front map lights. The horn was easy to press, despite the airbag, and nicely loud. The remote control presented the only real flaw we could see in Toyota's quality control; the lock button stuck in the case for a while, and it was rather easy to set off the panic alarm (fortunately, it's also easy to deactivate). We also never got the key fob's trunk opener to operate. Hopefully, Toyota will have changed key fob suppliers before you read this. One standard feature on the XLE was a rather clever rear sunshade with little holes in it so you can see through it, but it also absorbs sunlight, lowering interior heat and preventing annoyance (and sunburn) to rear passengers. When not in use, it retracts into a holder that is clearly designed to be part of the car; when you need it, it goes right into two openings in the ceiling. We have to admit that we never retracted it, since it doesn't really interfere with visibility except perhaps at twilight. The system looks good and is so useful we wonder why it isn't more common. Our test car included the V6 and five-speed automatic, 16 inch alloy wheels, full size spare, 2-wheel antilock brakes, power and heated outside mirrors, fog lights, auto air with filter, cruise, JBL stereo, power cloth seats, remote entry with a trunk release that we couldn't get to work, power locks, windows, and moonroof, woodgrain-style trim, autodimming rear view mirror with compass, tilt wheel, rear window defogger, alarm, and garage door opener in its $25,405 price. The Camry is far from the Honda Accord, though their sales figures are similar. The Accord emphasizes sportiness over comfort, so the ride is harsher and the acceleration a bit faster, but overall, we preferred the Camry. We accounted for one "conquest" from the Accord, by dedicated Honda lovers, who were converted by the soft, yet not wallowing, ride, the nicely done interior, and, of course, Toyota's reputation. That's one thing other automakers will find hard to beat.